Troubles started last week Monday in Auchi Poly as academic activities at the Federal Polytechnic, were paralysed after members of the Academic Staff Union of Polytechnic went on an indefinite strike over the non-payment of two months salaries. 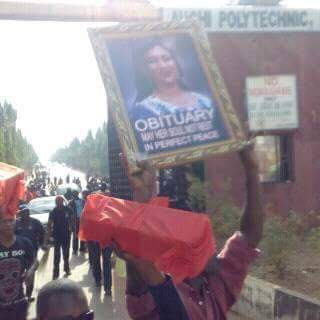 Some lecturers and students of the institution on Friday marched around the campus singing and carrying a photo portraying the obituary of the institution’s Rector even though she is very much alive and well saying MAY HER SOUL NOT REST IN PERFECT PEACE. According to a student who wrote on Facebook this evening, the school management has paid the outstanding December salaries and they are meant to be in school today to see if the lecturers will call off the strike so that academic activities can begin again. 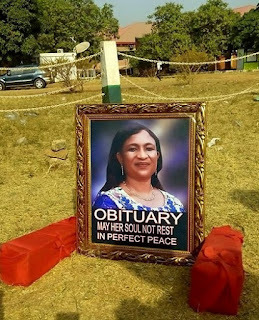 But then, they really went extreme with their protest and how will these particular lecturers who went on announcing the rector’s obituary despite being alive relate with her hence forth. Conflict resolution needed in Auchi Poly.